Can the economy continue to grow while creating fewer well paying jobs? – the answer is “YES”. During a recent show on Hardball (MSNBC) by Chris Mathews, the TV Host asked his guest – Ms. Tanden: “Are we getting fewer well-paying jobs while the economy continues to grow?” The answer is a resounding “YES”. The question was honest and sincere and the answer was also sincere. Beyond this and the despair, there was no logic to their discussion except for blaming the rich and the govt. ! Professional Work – where the wages are earned for value added solution – something new and unique. Yourself, me and Ms. Tanden and people like us belong to this class of work force. Physical work – where wages are earned literally for well defined physical tasks (like flipping the burger or driving trucks from point A to B, driving Taxi cab, factory work in China and India, moving packages at FedEx distribution centers, etc.). Of these four categories of work, those who work with the Finance get the bounty. They can put their money to work anywhere across the globe and make more money out of it. You and I gain here through global mutual funds and 401K investments! Then comes the professional work (and to be part of this gold rush or mirage, is why everyone is pushing for higher education). There are not too many like the TV show host, who constantly keep adding value – through the TV show, road show, books, speaking engagements, expert commentary, etc. Those who merely do what they are asked to do unwittingly fall into the next two categories: The information work and physical labor intensive work. They will continue to be paid poorly (since their value addition is only that much – very low) as their work continues to be de-skilled, standardized and automated. Till the 1970s these four classes of work were somewhat intermixed. One could migrate from one layer to the next (upward) and this created the large pool of middle class. Such mobility across the levels of jobs also created the American Dream: If you work hard and smart you can get ahead. This doctrine is no more valid. The four layers are nearly water tight and with a steady effort to push the work content and number of jobs to the lower paying information tasks and physical work tasks. The numbers of such low wage jobs created are increasing as we continue to bleed the professional work jobs to fewer and fewer in number. Now there is also a constant effort to de-skill and standardize information work and physical labor. As a result their value addition will continue to decline and hence the wages for such jobs will also decline. Programmable automation, robotics and such will also take more out of the lower paying information work and physical work jobs as well. (e.g. ): The octopod to deliver packages for Amazon will reduce more of the truck driver jobs. The number of professional jobs needed to create and implement the octopod will be far fewer than the professional jobs and lower paying jobs they will replace. 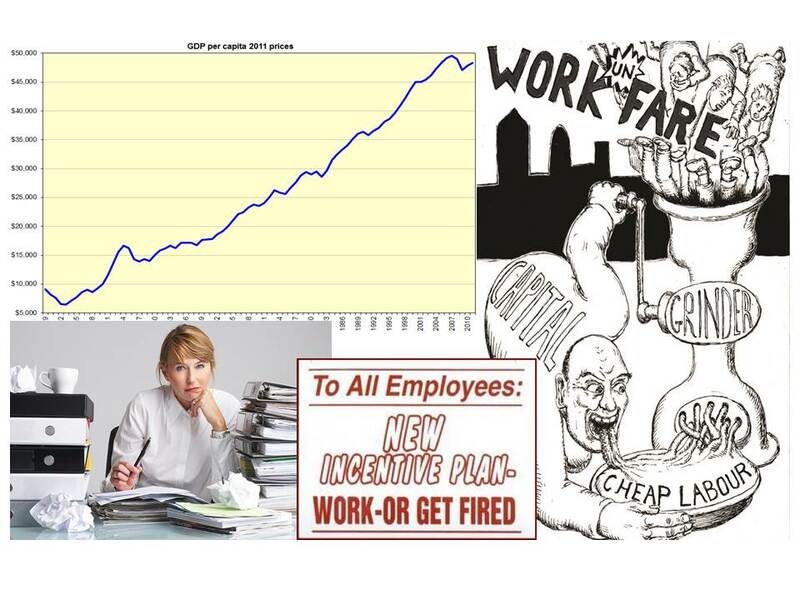 This is the productivity gain and the JOBLESS RECOVERY! In the beginning there could be an appearance of job growth at some locations, but across the globe there will continue to be less of a need for human centered activities called work and the reward for them. Hence the answer to the question: Can we continue to grow while creating fewer well paying jobs? – the answer is “YES”. Digital Technology and Global Financing are the drivers for this development. It is not the outcome or ploy by a few. The sad thing is that nobody recognizes this simple reality (neither the liberals nor the conservatives or the tea party or the burn everything down – angry folks). The heads of institutions and leaders in every function of the society also pay only lip service to this evolving fundamental issue. When the agricultural industry evolved, 40% employment in agriculture shrunk to 1% of the population now working in it. Industry driven employment replaced agricultural employment. Now, we are headed in the similar direction with industrial employment where few workers are needed. But there is no replacement in sight. Can there be a solution to this? – YES. But, before to get there, we need to recognize the problem, first (i.e.) It is the Binary Economy! This requires an unwavering attention of all and at every level of leadership.